Get these exclusive, custom made socks ~ available ONLY through Dog Scouts! 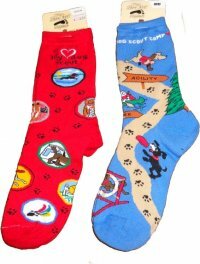 RED – features "I (heart) my Dog Scout" at the top of the sock, and the bottom of the sock is covered with tiny paw prints and different DSA merit badge images. BLUE – features "Happy Camper" on one side and "Dog Scout Camp" on the other, and feature all of the fun stuff we do at camp: agility, Frisbee, hiking, etc., with signs pointing the way along the path of sand with dog paw prints on it.